Word-based trim designations &#8220;added a little bit of complexity&#8221; to Chrysler showrooms, new Dodge chief Reid Bigland says. New Dodge President and CEO Reid Bigland is proving to be a man of letters as he revamps the brand’s trim-level designations for model-year ’12. “The immediate bias for Dodge will be just simplifying the product portfolio, partly to get back to the traditional SE, SXT, SXT-Plus, RT, RT-Plus kind of nomenclature, where possible,” he tells Ward’s in his first U.S. interview since being named to succeed Ralph Gilles. But some names such as Detonator and Shock, both exclusive to the Nitro cross/utility vehicle, are peculiar to certain models. 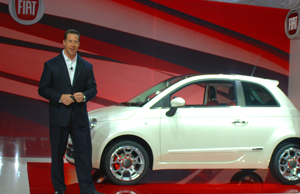 And the idea, though inspired, Bigland says, “added a little bit of complexity” to showrooms that also play host to the Chrysler, Jeep, Ram and Fiat brands, in some cases. Dealers seem receptive. “Keep it simple for the customer,” urges Brent Ravelle, general manager of Bustard Chrysler in Listowel, ON, Canada. Through May, Dodge car sales in the U.S. lag like-2010 by 3.1%, according to Ward’s data. But light-truck sales were tracking 32.7% ahead of prior-year. Chrysler shuffled its executive deck June 7. Gilles, who also is senior vice president-product design, was tapped to lead the auto maker’s newly established SRT high-performance brand. Bigland retains his position as president and CEO of Chrysler Canada and adds U.S. sales responsibility in addition to his job at Dodge. Total Chrysler sales were up 19.3% in the U.S., outpacing the industry which was running 13.9% ahead of 2010, as of May 31. Bigland expects Chrysler will turn in “strong” results for June, predicting the industry will maintain its upward trend through year’s end.